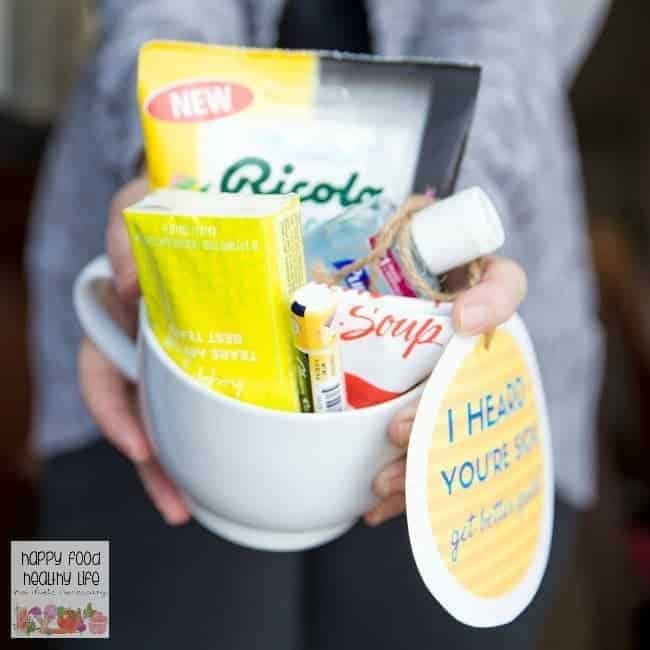 I enjoyed creating this Get Well Soon Gift Basket with the help of Ricola® as a part of a sponsored post for Socialstars. Have a friend who’s sick and feeling under the weather and want to put together an easy gift basket full of things they’ll actually use? I’m going to show you exactly what to include. Plus I’ve also made you a super cute tag you can print out to add to the gift. You know how it goes. You’re all ready for the holidays. You have cookie decorating planned. You have gift-wrapping night all ready with a side of eggnog and Christmas tunes playing in the background. Then all of a sudden, you start to feel that tickle in the back of your throat. You deny it and try to move on with your plans. But then the body aches come in the next hour. Before you know it, you’re marching up to bed with a blanket wrapped tightly around yourself just hoping you’ll feel better before the big man comes down the chimney. Maybe this year you’ll manage to dodge the bullet and won’t end up sick right before the holidays. But chances are high that someone in your family or neighborhood will be stuck in bed wishing for a speedy recovery. And if you want them to be well enough to show up to your holiday celebration, you may want to put together a quick little Get Well Soon gift to show them you are thinkin’ about ’em. 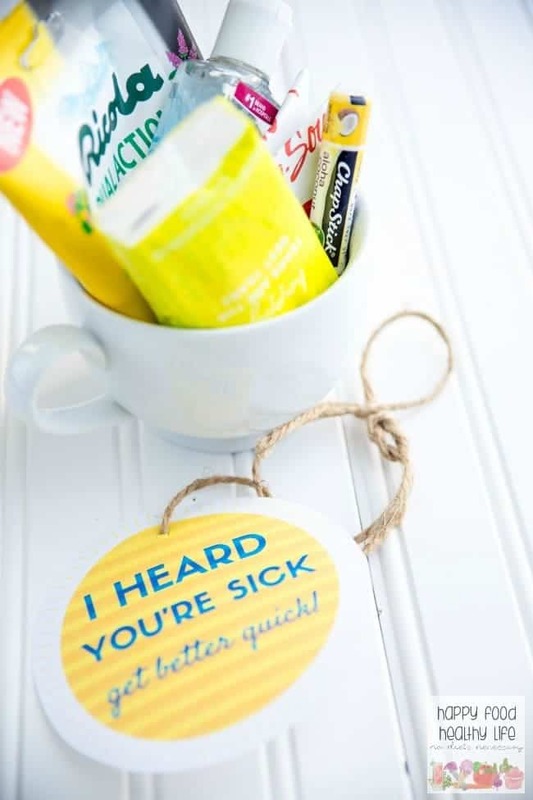 Create an easy Get Well Soon gift basket with a Free Printable Tag! I have to admit that I almost didn’t want to part with the Ricola Dual Action Honey Lemon Drops because Woah! They’ve saved my life on so many occasions. So I bought one bag for myself and one for the gift basket I was giving away. I suggest you do the same! The Honey and Lemon work together to soothe a cough and a sore throat all at the same time. In fact, Ricola is celebrating the 75th Anniversary of their Original Herb Drop, and they created a fun game you can play – seriously fun if you’re into trivia (ie perfect for your friend stuck in bed!). Click here to play the game. Oh, and like I promised, I created a gift tag you can just print out and tie to the little gift. Perfect to add the finishing touch to. 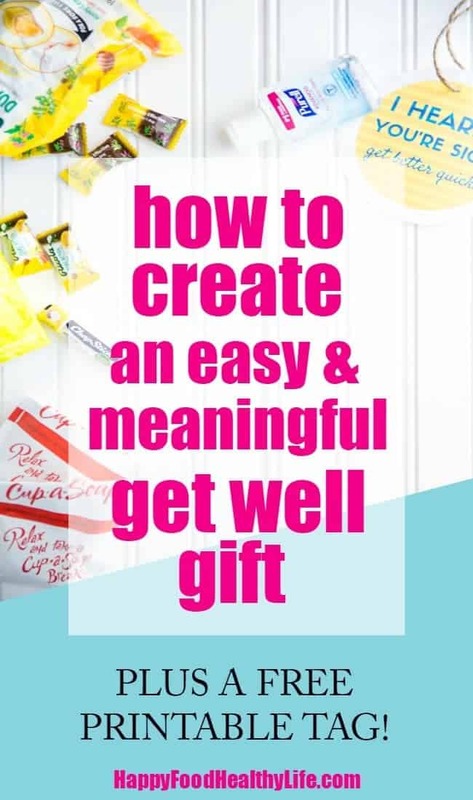 It’s a smart idea to create a gift basket of get-well items for someone who is sick! I never really thought of it, but the gesture can mean a lot for a friend that you care about. My grandma hasn’t been feeling too well lately, and I’m sure she would be happy to get one from me!